Things went so well during the 52 Ancestors in 52 Weeks Challenge, blogging my paternal ancestors from my Dad to my 4th great-grandparents, that I’ve decided to continue in 2015. 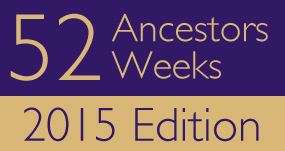 Amy Johnson Crow posted Announcing 52 Ancestors in 52 Weeks: 2015 Edition on December 17th. Although I love the suggested themes for January, I’m going to do things a bit differently next year. In my posts for 2014 I did an ancestor and discussed his/her parents, siblings, spouse, and children which caused quite a bit of overlapping and repeated information. So I’ve decided to combine the husband and wife into one post. This will help me get two for one! I’m scheduling a family group each week – an ancestral couple and their offspring- for my children’s paternal lines and my maternal lines. I’ve gotten used to posting on Mondays so that will stay the same. These are the families I want to do, again in order so that I can do the grands, then the greats, all the way to the 3rd great-grandparents. As you can see by the pedigree charts below, there are no ancestors missing in these generations. This will get me to #46. ♥ This is where the posts for 2014 on my paternal line fit in. Followed by my maternal pedigree: The next generation has 48 sets of 4th great-grandparents and ONLY 2 of these are unknown – the parents of couple #24 – I’m working on the doors in those brick walls. There are absolutely no America families in the pedigree charts above. Mostly Luxembourgish families and some German ones from the border areas. I’m thinking about doing a few more of my American ancestors – 5th, 6th, 7th great-grandparents, in no special order – we’ll see who I can dig up! There’s no one who is more organized than you are! Looking forward to read your posts! Thank you Karen. I don’t know what I would do without my genealogy software. It’s what keeps me organized. Cathy. I want to commit to this challenge, but I know there are days where I’m busy and can’t write. I do try to post 2-3 times a week. I think it would be a fun challenge. Maybe I shouldn’t make it so difficult and just do it. Not like anyone is grading me. Thanks for the inspiration. And, like you, I don’t know what I would do without my genealogy software. Cathy, I like your idea. I also have to ask – are your family names common for that area or are they as unusual as they look? I have a blend of common and not so common, but my lucky husband has Williams, which took me 20 years to unravel. Happy New Year! Linda, all of the families names are common and still in use in Luxembourg. #39-42 are just across the border in Germany and I’ve found them in the German Family Books for the villages for several more generations back. So I have the dates and places but no copies of the records. Might be a challenge to get my hands on them. Happy New Year! I bow to you for taking on another year. In as much as I’d like to, working full time made it difficult this year, but I never gave up. I look forward to reading your new stories and I’ll add something maybe monthly in the new year. Jeanne I couldn’t do it if I were working. Each week’s entry took many hours of research. While I was at it I tried to clean up things around that family in my database. I took the easy way out citing sources by linking directly to the online databases but there were still some that had to be cited. It’ll be nice to see your monthly posts – shouldn’t stress you out too much. 🙂 Happy New Year! Congratulations on making it through — and for already having a plan for 2015! I look forward to reading your posts. Happy New Year! Thank you Amy. Hoped that you wouldn’t mind my posting the link to this post along with my #52 post in your comments. I’ve really enjoyed getting to know you through your ancestors this year. Happy New Year! I don’t mind. That was very sweet of you! I’ve enjoyed getting to know you this past year, too. Too bad my stay in Luxembourg was only about an hour — it would have been fun to meet! Maybe one day you’ll be back over here. Though it is the middle of the month I have wanted to share we as a family have decided to do DNA. Perhaps this will give us the tips and results needed to go on. So very happy you are continuing on your family journey. I would so have missed learning more on your family. Enjoy!! Thank you Cathy. If I hear of any of my Roop/Rupe cousins doing DNA I’ll let you know. It’s going to be a fun year working on only families in Luxembourg since the records are a genealogist’s dream!!! Next Next post: 52 Ancestors: #52 Levina DOSS – Another Unmarried Mother and How She Helped Me Bring This Challenge Finale to an End with a Bang!